Below are links to videotapes of three New York Left Forum panels (June 9, 2018) on “Syria and the Left” as well as two interviews conducted by Stanley Heller, administrator of Promoting Enduring Peace, and host of the TV program The Struggle. 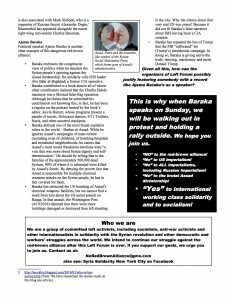 The first interview is with Robert Cuffy, supporter of the Socialist Workers’ Alliance of Guyana, who spoke on the panels and took part in a silent walkout when Ajamu Baraka (Assad apologist) spoke in the last plenary. The second interview is with Ann Eveleth, member of the Anti-War Committees in Solidarity with the Struggles for Self-Determination who also spoke on the panels and participated in the walkout. 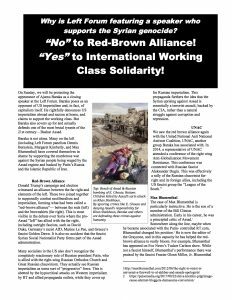 Below is also the flyer that members of the Anti-War Committees passed out to challenge Ajamu Baraka.